Situated at the foot of barren Taragarh hill in the old part of the town of Ajmer in Central Rajasthan, is the tomb of the Sufi saint Khwaja Moin-ud-din-Chisti (1140-1235), popularly known as Dargah Sharief, the most famous Muslim pilgrimage center in India. This grand marble shrine begun by Iltutmish and completed by Humayun, contains the relics of the great Sufi saint. It is considered the second holiest pilgrim site after Mecca. 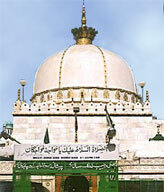 It is believed that seven pilgrimages to Ajmer equal one to Mecca. Khwaja Moin-ud-din-Chisti was a Persian orphaned at the age of 16 who later turned to spiritual life. Believed to be a direct descendant of Ali, the son in law of Prophet Mohammed, the saint arrived in Ajmer in 1192 at the age of 52 during Prithwiraj Chauhan's rule. It was the time when Islam was on the verge of spreading to India. The saint who came in peace devoted his life to the poor people of Ajmer and its region. He never owned a house or even proper clothing cause he believed that private property was a hindrance to spirituality. The force of his spiritual presence won over, even the Hindu Rajputs at that time. Not only the Muslims but people of other religions also throng the holy dargah and pray for the fulfillment of their desires. The shrine is considered to be a place of wish fulfillment for those who pray with devout and pure hearts. The devotees also offer flowers, velvet cloth, perfume and sandalwood at the shrine. The entrance to the dargah is through the bazaars lined with shops selling beads, caps and scarves to cover your head, chaddars and flower offerings. The approach to the main gate is on foot, or by auto or tonga. There is an enormous marble gateway built by Emperor Shahjahan at the precincts of the shrine. The main entrance in the north (70 feet high) with silver doors, was built later in several stages by Nizam Usman Ali Khan of Hyderabad. As you enter the courtyard there is a red sandstone mosque built by Akbar (1570) to the right. To the left is a big hall Samakhana or Mahfilkhana (assembly hall) 46 feet square built by Nawab Bashir-ud-Dowla Sir Asmaan Jah of Hyderabad which is used only during the annual 'Urs'. Two huge iron degs or cauldrons with capacities of 2240 Kg and 4480 Kg respectively, donated by Akbar and Jehangir to feed the poor are kept in the courtyard. These cauldrons are for offerings of money or valuables from pilgrims. On special occasions, Kheer cooked in these cauldrons is distributed among the pilgrims. The princes or well-to-do pilgrims on their first visit pay for a feast to be cooked in these cauldrons, generally during the Urs period. The saint's tomb is in the centre of the second courtyard and the actual tomb inside is covered with gold cloth and surrounded by a silver railing. The tomb is of marble and the crown (dome) on the tomb's summit is made of solid gold. The walls are panelled with velvet curtains, including one from Mecca. The atmosphere inside the shrine is charged with prayers said constantly, burning of incense and offerings of flowers mainly rose. In the open space in the foreground is a white marble mosque, Jama Masjid or Shah Jahani Mosque (1650) with 11 arches, built by the Mughal emperor Shah Jahan which is a fine example of Mughal Architecture. All the 99 sacred names of Allah with 33 Quranic verses are beautifully inscribed in the mosque. Nearby is the Mazar (tomb) of Bibi Hafiz Jamal; the Saint's daughter, and the tomb of Shah Jahan's daughter Chimni Begum who stayed with her father during the seven years he was held captive by his son Aurangazeb. There is a mosque Alamgiri Masjid, built by Emperor Aurangazeb, a prayer room and a tank at the south end of the Dargah over which Queen Mary has built a roof. The Khwaja left for heavenly abode after a six day prayer in seclusion. In commemoration, the anniversary of the saint's death, the Urs is held for six days every year. The saints tomb attracts thousands of pilgrims every year irrespective of their faith, during the Urs falling in the seventh month of the lunar calendar ( May/June). History says that Emperor Akbar used to make an annual pilgrimage to Ajmer and he sought blessings for his son at the Dargah. Qawalis and poems are presented continuously in the saint’s honour and feasts are cooked in the huge cauldrons, about five lakh people is said to visit during the Urs. On the last day women wash the tomb covered with roses, with their hair and squeeze the rose water into bottles as medicine for the sick. A community called 'Khadim' manages and maintains the dargah, a right they inherit by birth. The 6th day morning of the 'Urs' is specially for the Khadims and all other pilgrims and visitors are banned from entering the dargah.